Quickly fold paper for occasional jobs with the Martin Yale Premier P6400 Desktop Manual Feed Letter Paper Folder. 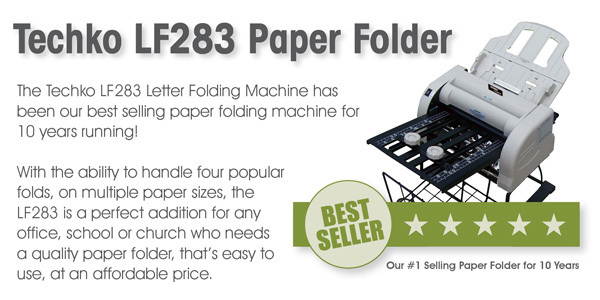 This paper folder is perfect for use in small offices, churches, schools and more. It is used on the side of a desk for occasional jobs. It can fold up to three sheets of paper and can accept stapled sheets of paper. It creates either a letter fold or a half fold. It handles paper from 16 #to 24# bond. The Martin Yale P6400 weighs only twelve pounds, making it easy to move from desk to desk, or transport to other locations, as needed. - Dimensions: 4.5" x 6.8" x 7"
- Weight approx. 12 lbs. Note: The fold performed by this machine is NOT adjustable.